- Photos below from Richard Bolt, Eric Eagan, Ron Heerkens Jr., and Scott Dunlap — check out their albums/posts; great work all around! - The 'Stache Rap (#stacherap) via my friend Momi! 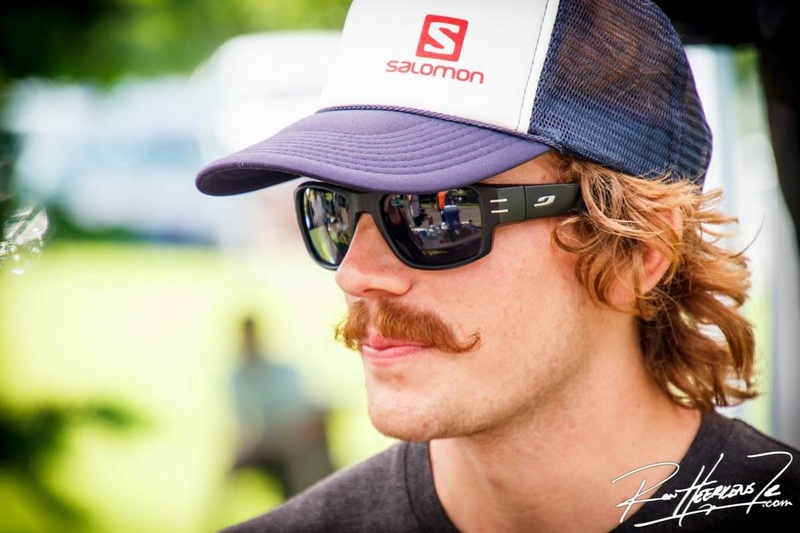 - Cool video of the start from Will Noonan. 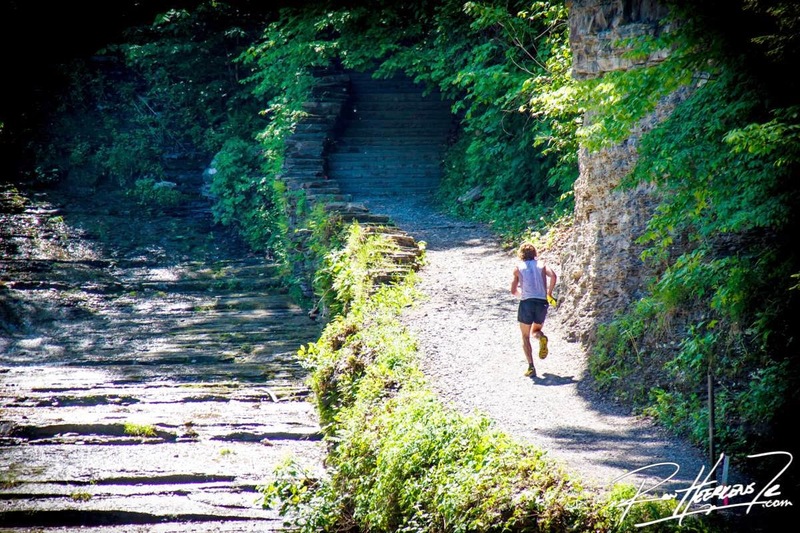 The beautiful trails of Ithaca. This story starts with Ian Golden. 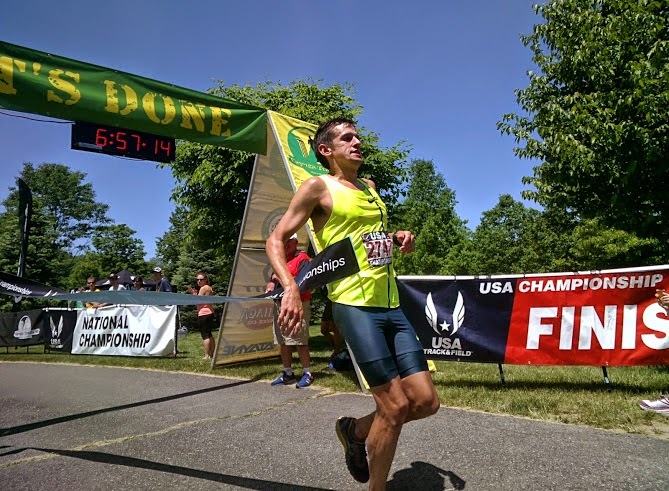 He is the owner of Finger Lakes Running &Triathlon Company and the race director of the Cayuga Trails 50 Mile, now in its second year, and host of the USATF 50 Mile Trail National Championships. Ian first made contact with me ahead of last year’s inaugural event in his efforts to recruit a top field. He did a great job, and I had my hands full in 2013 with Sage Canaday, Jordan McDougal, Yassine Diboun, Ben Nephew, Brian Rusieki, and others. I managed a second place. If I could work it out in my schedule, I knew I would come back this year. I commited in the spring, and I eagerly anticipated returning to Ithaca—which much reminds me of my current Bloomington, Indiana home—to race and rekindle the friendships made last year. While Sage chose not to return to defend his title, the field may have been even deeper this year. Most of the other top runners returned, including McDougal, Diboun, Nephew, Rusieki, and Cole Crosby (a top local-ish talent). 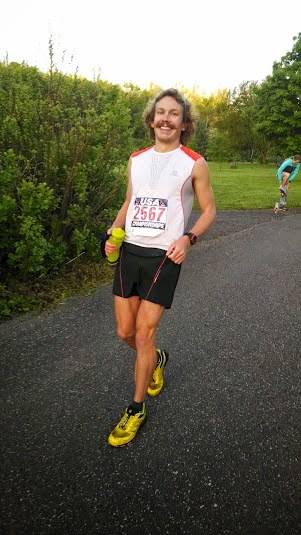 Added to the mix were my buddy Chris Vargo, a Bloomington, Indiana native and Flagstaff transplant who is in great form; Michael Owen, fresh off a sub-6 hour finish at the Ice Age 50 Mile; Iain Ridgway, a formidable opponent on tough courses especially; Zach Ornelas, a 2:20 marathoner and World Mountain Running Team member. There were still others I didn’t know much about, and it seemed likely that one or more of them would have a breakout race (this turned out to be Tristan Williams, but more on that later). For the women’s field, Ian attracted some serious star power in Magdalena Lewy-Boulet, Krissy Moehl, and Cassie Scallon (though Cassie came up injured). A number of other strong women promised a competitive ladies’ race as well. My long weekend began on Thursday, when I arrived with Vargo on a connection from Detroit. Ian picked us up from the airport and it was straight to the Ithaca Festival, which is kicked off by a 1 mile road rade and a parade. We watched Yassine and Ian’s daughter Maren race the mile, and then settled in for the parade. In this uniquely ‘Ithacan’ annual event, any community group, club, or organization can have a slot. The variety and eccentricity of the groups was quite entertaining. As Vargo put it, it was like Bloomington on crack—or maybe a Portlandia sketch. 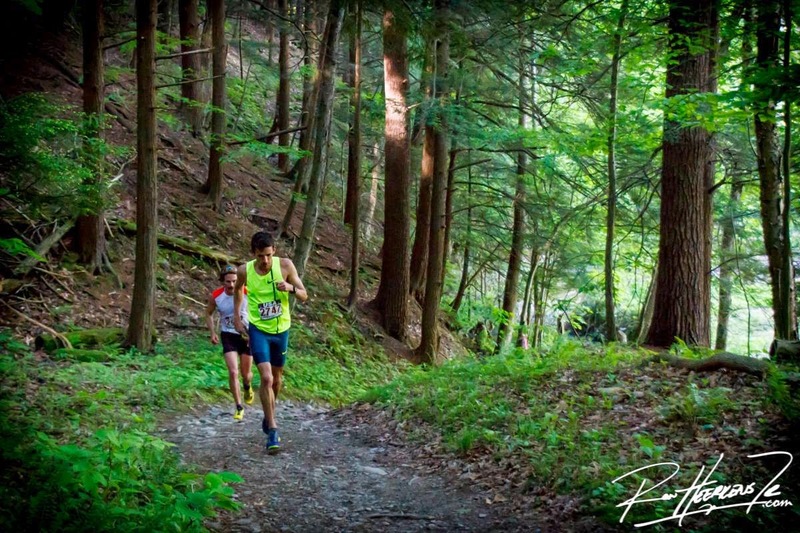 We later made our way to our cabins in Treman State Park, the site of the race. We met up with Brad Lombardi (aka Salty Peacock), a great dude and Badwater enthusiast/hopeful who recently finished the grueling Brazil 135 with no crew. 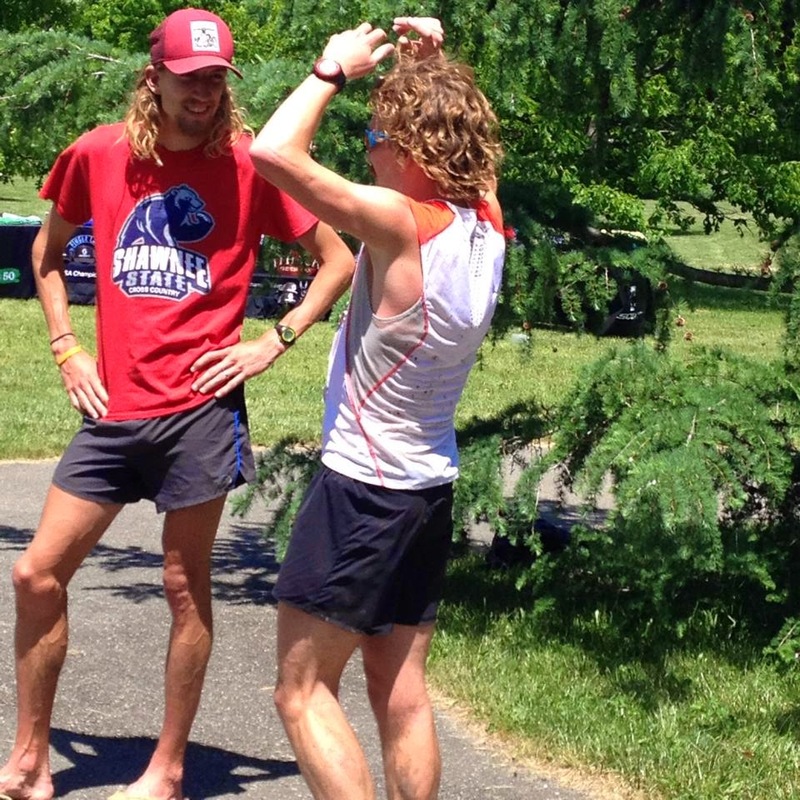 Brad had been staying at Ian’s home for the previous few weeks while he trained to manage a new running store in Croton on Hudson, NY. We disrupted Brad’s usual routine of waking at 4:30 a.m., forcing him to adjust to our schedules and sleep in until 9 or so the next morning (Vargo still being on Pacific Time, me just being a bum who sleeps in). Friday morning we ran the first 6 miles of the course with Ian and got a preview of some of the course changes. Significantly, these included a very steep climb up Red Pine Trail (due to closures on the Gorge Trail) and a steep, staired descent called Lucifer’s Steps. After bumming around Ithaca the rest of the day, we wound up at one of my favorite places (surprise? 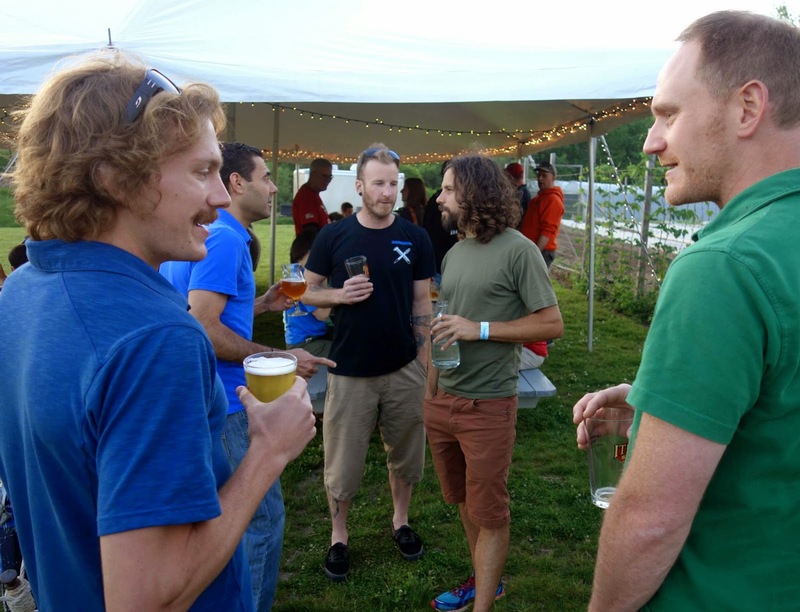 ), Ithaca Beer Company for dinner and drinks with some other runners. Local ultra runner Scotie Jacobs is in charge the facilities at IBC, and for this race he collaborated with the IBC brewmaster to create a delicious, unique, and sessionable brew that he named Lucifer’s Steps. 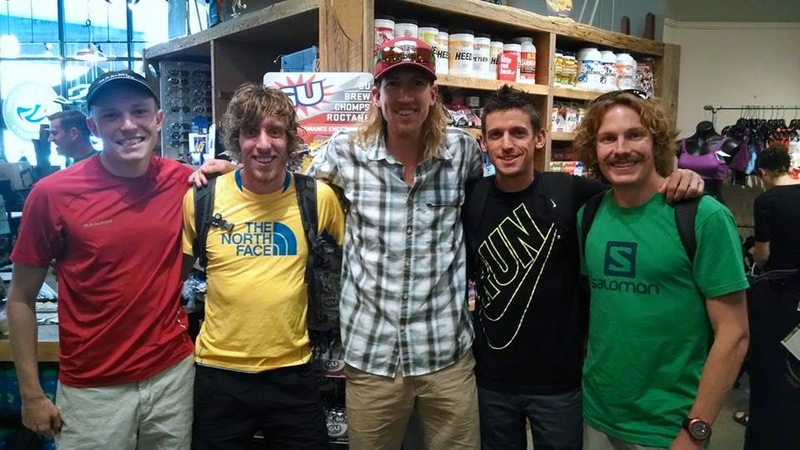 Meeting up with some old friends at Finger Lake Running & Triathlon Company on Friday. Enjoying a Lucifer's Steps brew pre-race. Co-brewer Scotie Jacobs and RD Ian Golden in background. It was here I met the Red Vault Productions crew, up from Long Island to create a trail running film about this year’s race. I would interview with them the next morning, as would many from the race’s elite field. The Red Vault folks also had a film in the Trails In Motion Film Festival, which took place on Saturday afternoon. 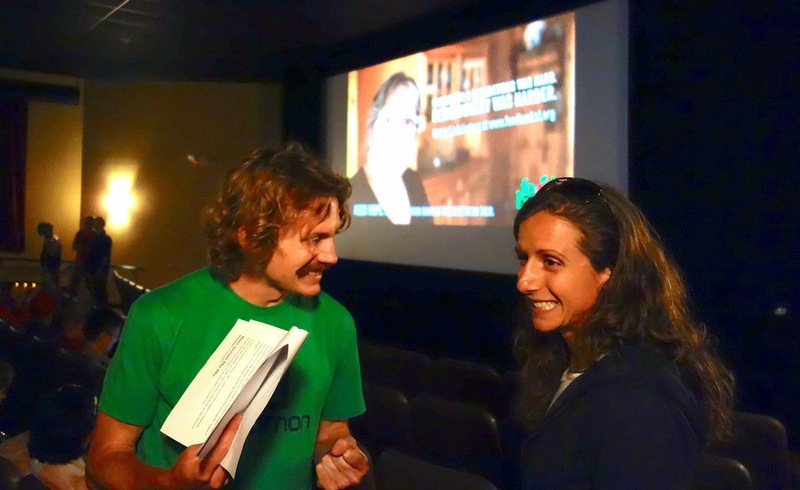 I co-emceed with Krissy Moehl, and a good-sized crowd enjoyed several features and a number of short films—all about trail running. This was yet another aspect of the weekend that Ian put together that shows his passion and commitment to growing the sport. Dinner followed at Ian’s house, where his wife Sheri cooked a delicious pasta dinner for those of us who were staying in the cabins. 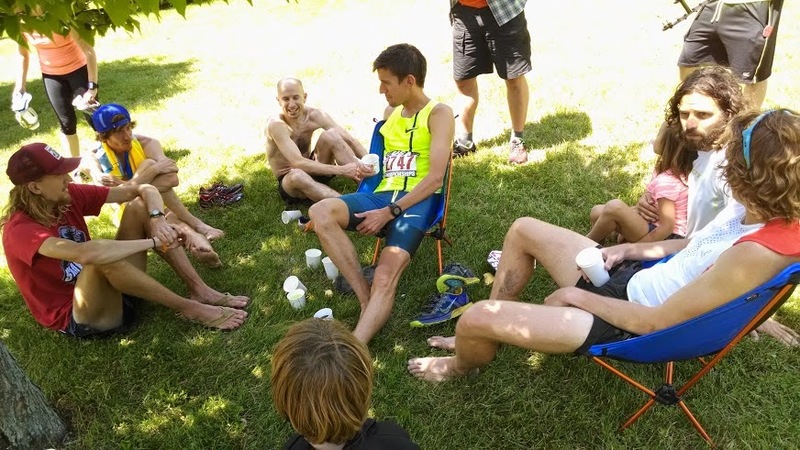 It was great meeting some new runners and catching up with others I’ve raced in the past, hearing their stories and where their recent adventures had taken them. It was a relaxed way to spend a pre-race evening. At the end of my Red Vault interview earlier that day, I was asked: in one word, what is trail running to me? Without having to give it much thought, I said community. It’s what makes this sport so unique. The comraderie and shared values of those in the trail community set it apart from the oft-overblown road racing scene. 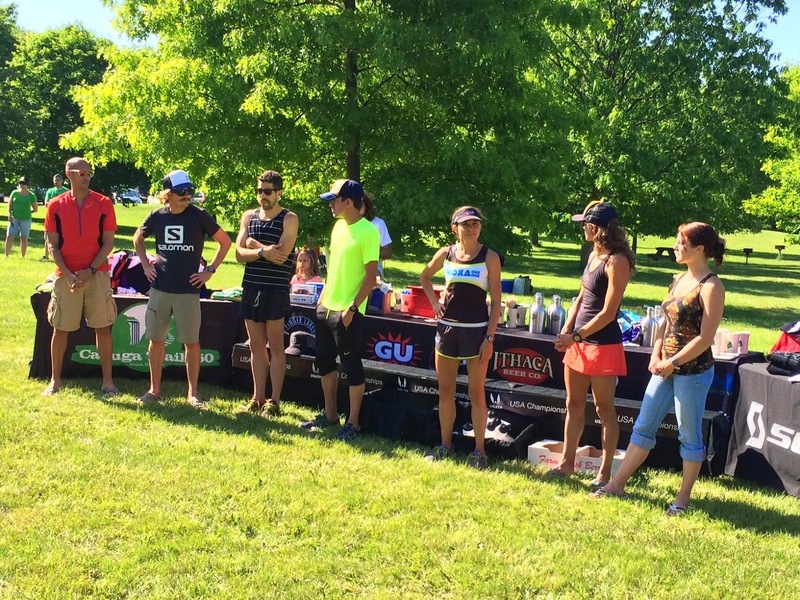 It’s a virtual guarantee when you show up to a trail or ultra race that you will leave with new friends. Everyone is approachable and simply excited to be covering natural landscapes on foot. 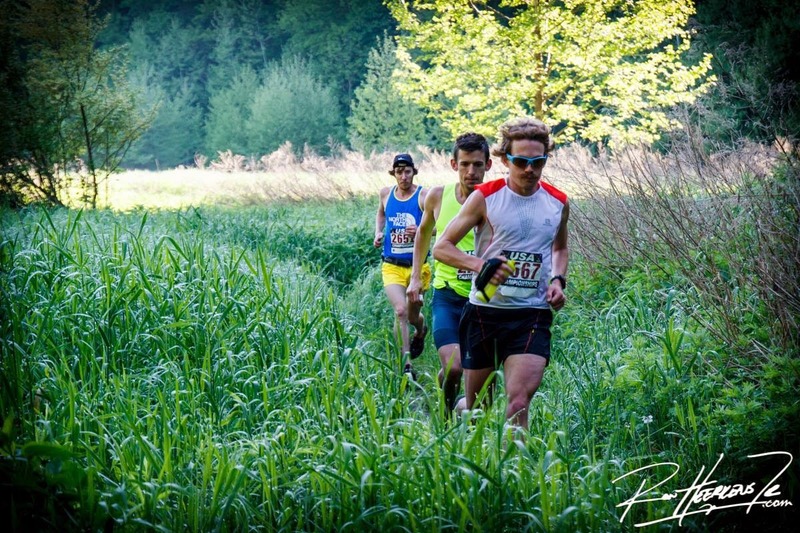 And this, in short, is what makes the Cayuga Trails race so incredible. Not only is it near-flawlessly executed, but Ian goes to great lengths to foster community. 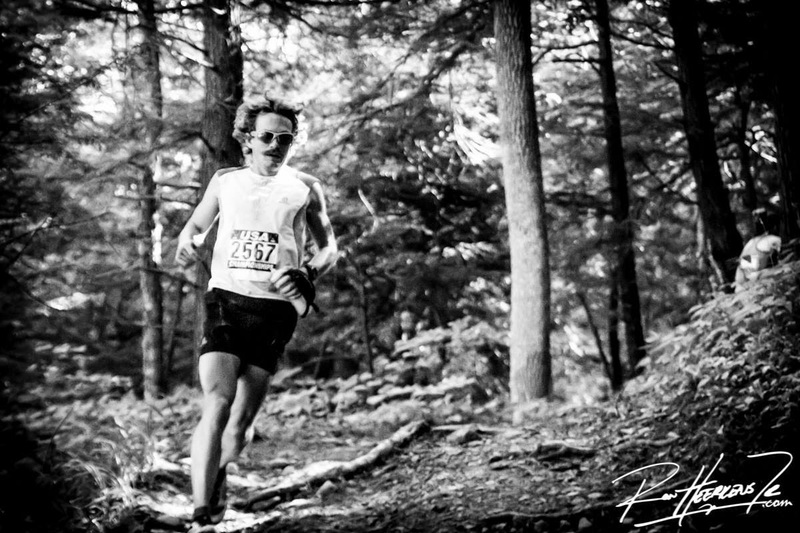 He’s as good at this as anyone I’ve encountered in the ultra and trail running world. I can’t recommend the race enough. And I’m sure his other races, including the Virgil Crest 100 (and 50) are great too! 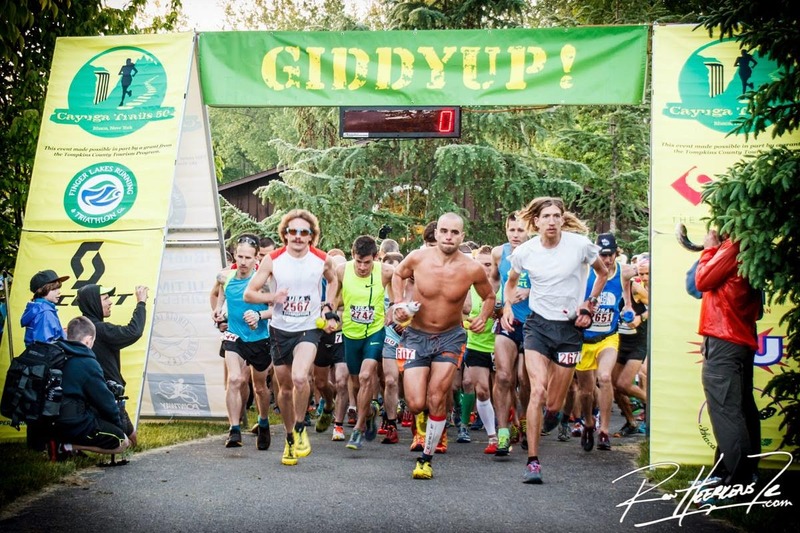 The course consists of two 25-mile loops or out-and-backs. I thought I would take the first loop on the easier side, even allowing others to get away for the sake of staying comfortable. I knew Vargo and McDougal were formidable climbers. I was determined not to get caught up chasing them up any of the big ascents. And I didn’t. However, I also wanted to make use of my speed on the descents and the flats. 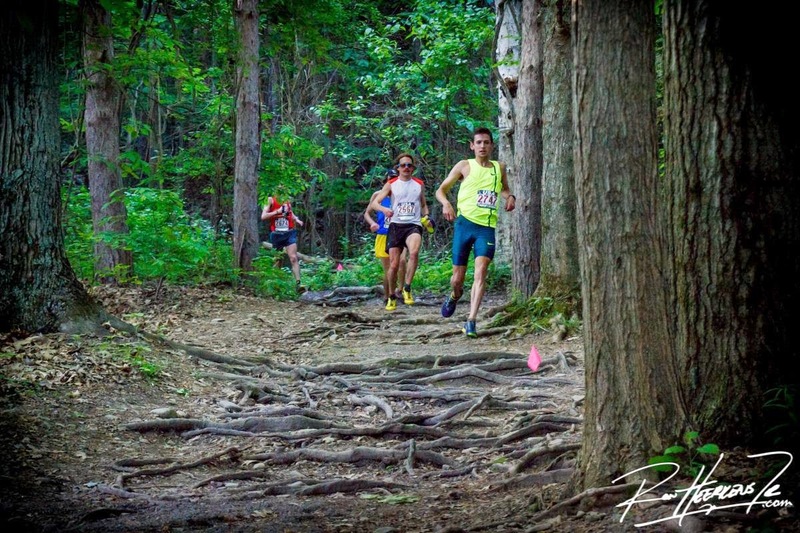 So when at one or two miles into the race the lead pack—still over a dozen runners at this point—bunched while slowly descending some steps, I swung wide on the trail and pushed into the lead. I dropped the pace for a bit on some rolling terrain just to create some space. But by the first aid station, a pack of five was clear: me, Vargo, Jordan McDougal, Michael Owen, and Zach Ornelas. Shortly after, I actually broke clear briefly after descending Lucifer’s Steps, but the pack was together again by mile 8 or so, shortly after the very steep Lick Brook climb. I think we all knew the pace was too fast, but it seemed that every time it started to lag a touch, someone new would take over and push. I was certainly guilty of that. In for a penny, in for a pound… or something like that. 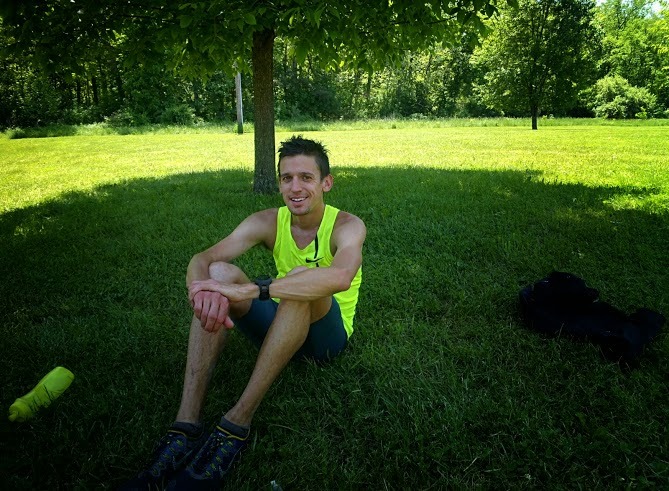 We hit Buttermilk Falls AS (mile 12.5) in a ludicrous 1:30, a completely unsustainable pace for a 6-hour finish. The pack of five remained until we hit the long, somewhat technical descent that skirts around the Lick Brook climb. I pushed there and got away along with Vargo and McDougal as we hit the Underpass aid station on the return of loop 1. McDougal dropped back shortly thereafter, and Vargo and I ran in tandem toward the Start/Finish area to close the first 25 mile circuit. Unfortunately, we missed a turn that cost us about 4 or 5 minutes and added in an extra couple hundred feet of climbing. This mistake put Michael Owen in the lead. It sapped me a bit mentally, but the real damage had been done by our over-eager racing. It took a pretty heavy toll on us five foolhardy runners who ignored reason for the first half. I was probably chief fool. Carnage ensued. McDougal would drop at 25 miles. 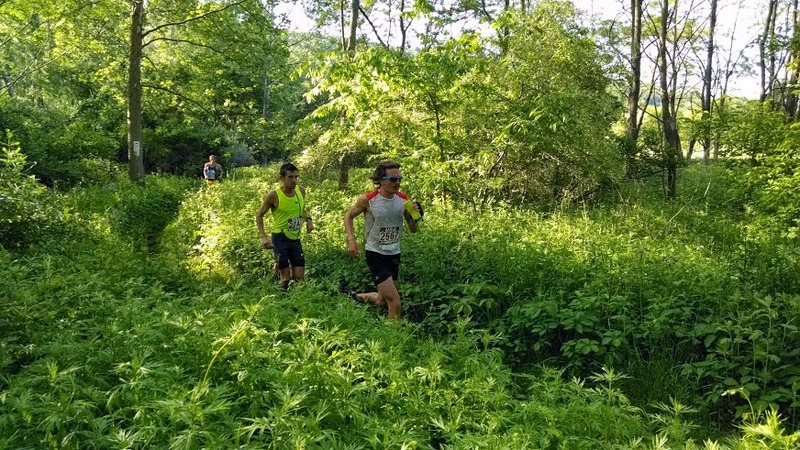 Owen would hold the lead until the Lick Brook climb, eventually getting passed by Vargo and then dropping out at Buttermilk Falls (mile 37.5). Ornelas struggled home to a sixth place finish in his 50 mile debut—a painful first experience at the distance. That left me to hold it together as best I could while Vargo climbed away from me. True to his mountain running training grounds, he bested me on the climbs all day. Enter Tristan Williams. The two-loop nature of the course allows a view of your competition as you head back out; and I saw Tristan lurking about 10 minutes back and looking good. Sure enough, he caught me as we headed toward Buttermilk Falls for the second time. I stayed in range for a couple miles, but couldn’t hang. His passing me had the positive effect of waking me up a bit, helping me to hold it together better on my way to the finish. Meanwhile, a hard-charging Tristan closed quite a bit of time on Vargo, finishing in 7:02. Vargo, to his credit, hung tough and came out with his first national title in a final time of 6:57. 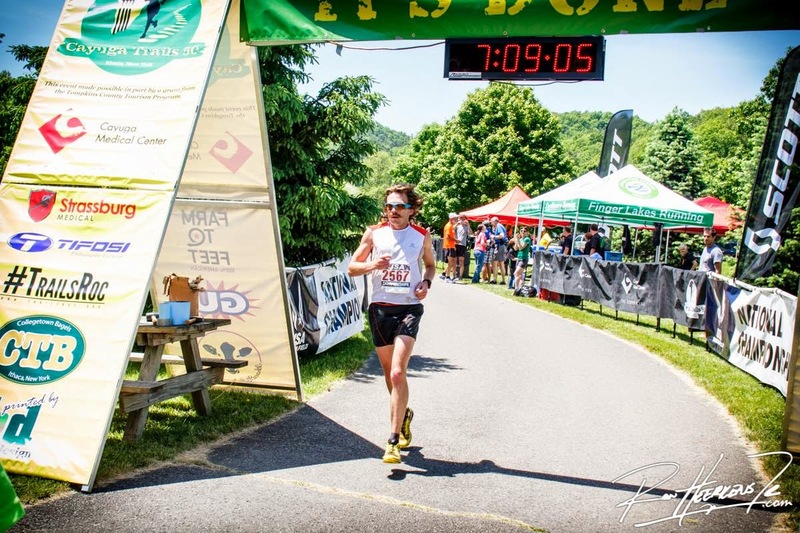 Tristan wasn't on too many people's radars, though he's had some solid results at UROC and the US Mountain Running Championships last year. He ran really well; a smart and impressive race. He's also got a great mustache, so you know he's cool in my book. Vargo later told me he continued to climb well all day, but felt pretty beat up on the rollers and descents on his second loop. That got me thinking about the race, and what I could or should have done differently. In retrospect, I think that there's really no way I was beating Vargo on that particular day. If I had tried to run the race conservatively, I'm pretty sure the whole pack would have just stayed conservative. Vargo would have climbed well and I don't think I would have been able to take him. And Owen, McDougal, et al. might have kept it together and beaten me as well. 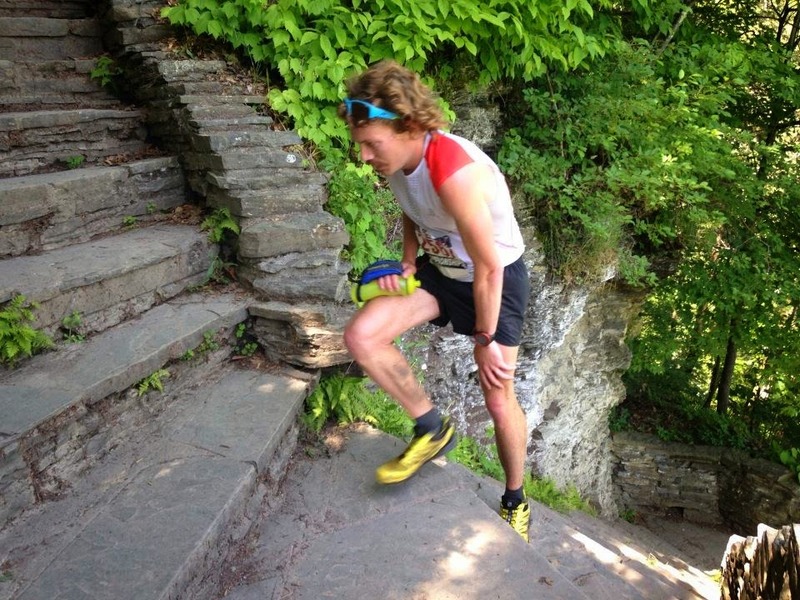 I needed to try to run Vargo's legs off him a bit, beat him up with faster running on the flats and descents. Which is what I tried to do—it just didn't work. I could have waited until later in the race to do that, but I really don't think it would have changed the outcome. The bottom line might be that in a very competitive field, I'm simply not very likely to win a race with over 11,000 feet of vertical gain. I can try to be more diligent in my climbing preparations in the future, but until I live in the mountains, this will likely always be a bit of a handicap. Now it's time for a short break before building up to some big summer miles in preparation for the fall racing season. Excited to get back to it! Warming up and staying loose pre-race. Chatting with Michael Owen post-race. Relaxing with Vargo. Our UGo Bars crew thoughtfully brought us some chairs! RD Ian Golden joins the crew to chat about the race. The men's and women's podiums. Good to hear your honest report - who knows how it would have ended up if it had gone out slower! Not that I am trying to follow you around, but I am toying around with the idea of White River in July. Great report, Matt. Hopefully you'll be back again in 2015! Some great competition (even if a bunch of you went out too hot). 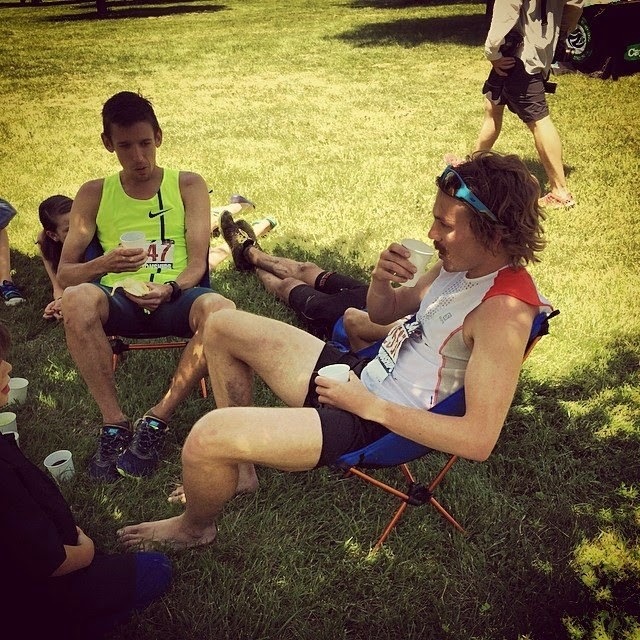 So awesome to hear what happened between the aid stations and get your reflections. Hope to get the opportunity to see you race again. You are a hell of a champion. 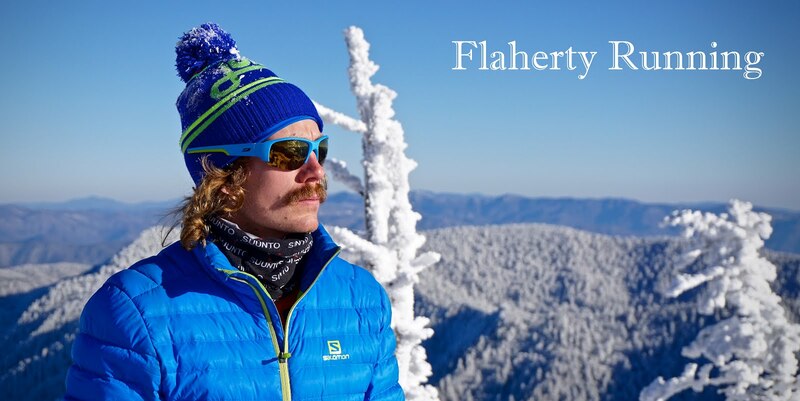 Plus, you have the best damn mustache out there! As always, great to race (and drink!) with you. Glad you concurred this was an amazing race - Isn and his team really do a fabulous job! Cheers, Scott. Likewise! See you around the roads or trails again sooner or later. Maybe Boston 2 Big Sur?